Pikes were the principal weapon used by the insurgents. It was regarded as an effective weapon especially in close combat. The original pike head was six inches long and spear shaped. The handle was approximately six feet long. Later a hook was added to the side of the pike head to enable the insurgent to cut the reins of horses in order to dismount the rider. 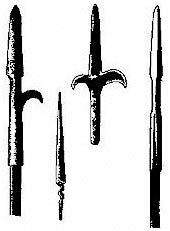 According to Myles Byrne, the pike was more easily managed than a soldier’s musket or bayonet. The Blunderbuss was well suited to close-range confrontations. Its wide muzzle helped intimidate an opponent and its charge of numerous lead balls gave its owner a better chance of hitting the target. Blunderbusses were often fitted with spring bayonets for additional protection – on releasing the catch the bayonet would flip forward and lock in position, and pistol butts could be used as clubs. The flintlock musket was the main weapon for European armies between the 1660s and 1840s. For military purposes the musket was loaded with a ball or a mixture of ball with several. It also had a large shot (called a buck or ball) and had a firing range of 75 to 100 metre. 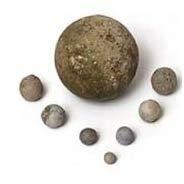 A grapeshot is a type of shot that is not one solid element, but a mass of small metal balls or slugs packed tightly into a canvas bag. It was used both in land and naval warfare. When assembled, the balls resembled a cluster of grapes, hence the name. On firing, the balls spread out from the muzzle, giving an effect similar to a giant shotgun. Grapeshot was devastatingly effective against massed infantry at short range. It was used to savage massed infantry charges quickly. Cannons would fire solid shot to attack enemy artillery and troops at longer range and switch to grape when they or nearby troops were charged.